Since 2015, Valley Art Center has been bringing the joy of art making to senior citizens who cannot conveniently travel to the VAC campus. Every week, residents at Hamlet Village and Arden Courts can look forward to a class, free of charge, led by Valley Art Center instructors Darlene Jackson and Victoria Wagner. Lessons are tailored especially to the needs of the residents, as accommodations are made for vision, hearing, fine motor and memory challenges. Residents, staff and instructors praise the visibly beneficial results this program provides residents. 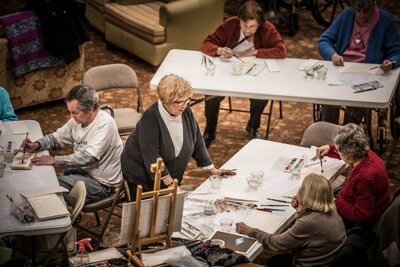 At Hamlet Village, longtime senior watercolor instructor Darlene Jackson delivers classes to residents who are also invited to exhibit their art in the Hamlet Atrium. This relaxed class welcomes all levels of senior students who wish to paint from a provided still life or from photographs of landscape, seascape, architectural or floral subjects. 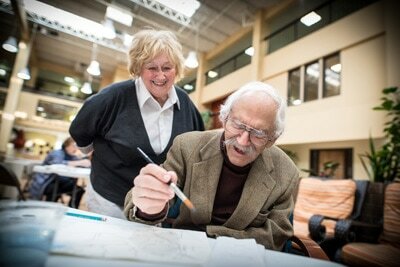 Students enjoy camaraderie plus the many benefits that creativity has to offer to older adults. Senior VAC instructor and painter Victoria Wagner presents mixed media projects to memory-care residents at Arden Courts who proudly display their work in the Arden Courts studio. The residents begin with a theme and pictures Victoria has cut out in advance. The students paint their own background and assemble a collage on top. For example, Victoria may cut out many different doors that can open. The residents choose, from the other collage items, what they want to see behind the doors: a child with a bouquet of flowers, a pet running towards the door, a couple holding hands, etc. 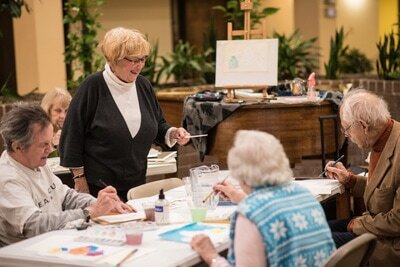 Valley Art Center is eager to expand the Senior-to-Senior Art program to other retirement facilities in the Chagrin Valley. To see how you can be involved, please contact Executive Director Mary Ann Breisch at 440.247.7507. Funding for this program is made possible by a grant from the Ohio Arts Council and from private donations.